Sclerotherapy, which has been available since the 1930s, is another treatment option for varicose veins and spider veins. This procedure uses a highly concentrated saline solution or a specially made detergent that is injected directly into the vein, causing the vein to disappear gradually over three to six weeks. 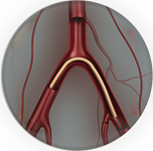 The procedure is simple, relatively inexpensive, and can be performed in an outpatient setting. Complications are minimal but do include pigment staining, blisters, and — rarely — the formation of a skin ulcer. Patients are encouraged to maintain their active lifestyles immediately following the injections. They are able to drive themselves home after the procedure because no sedation is needed for this relatively painless procedure. In sclerotherapy, a sclerosing agent is injected into the veins using fine disposable needles. The procedure has been refined in more recent years for injecting tiny superficial veins (microsclerotherapy). 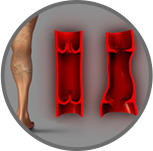 The solution destroys the layer of cells that line the vein wall causing the vein to close, preventing any blood flow. Small veins fade over a period of 6 weeks or so, large varicose veins take longer. Prominent veins frequently have to be injected more than once. In any one treatment sessions many veins may be injected. This can involve 6-10 injections for large varicose veins and some 50 or more injections for smaller spider veins. The largest and deepest veins need to be treated first. The treatment required is determined by an ultrasound examination which gives a precise diagnosis of any significant vein abnormalities. Endovenous laser ablation and ultrasound guided foam sclerotherapy (UGS) can be used to treat larger varicose veins – which avoids the necessity for any surgery. There are 3 solutions registered for use in Australia. Detergent agents are long chain fatty acids and they have an excellent safety profile. They can be made into foam for treating large varicose veins. Foam is more efficient and effective – having fewer side effects and a lower total dose of sclerosant. 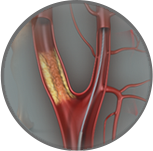 Foam reduces the number of injections necessary and improves contact with the vein wall. Sclerosants are removed by the liver (like most drugs) and are not cumulative. Sodium Tetradecyl Sulphate (STS) has been available for around 60 years. It is safe and effective. It is the more potent sclerosing agent. If diluted to very weak concentrations it works well on tiny veins while higher strength solution/foam is used for large tortuous varicosities. It is not one of the ‘sulphur allergy’ medications. Laureth 9 – formally called polidocanol has been in Europe for 40 years. It has been available in Australia since 1990 and is used on medium to small veins. It cannot be used in high volumes. Osmotic agents – Hypertonic Saline is a strong (20%) salt solution. It is a more painful injection than the above solutions and is only suitable for use in surface veins up to 2mm. Following each sclerotherapy session you will be required to wear a class 2 surgical compression stocking to assist closure of the veins. The length of time that the stocking needs to be worn varies from several days to two weeks depending on the size of the veins injected. It is important to adhere to the length of time advised to achieve the best results. Compression minimises blood trapping and pigmentation, reduces the number of treatments necessary, reduces the risk of deep vein thrombosis (DVT) and Thrombophlebitis, and reduces the incidence of recurrence. No compression stocking is sometimes appropriate for very fine veins. Surgical compression stockings have graded compression, maximal at the ankle, least on the thigh. Good compression is difficult to maintain with bandages for more than a few hours. It is mandatory to walk for at least ½ an hour per day while wearing the stocking, including the day of the procedure. Walking tends to ease aching that occasionally occurs. Swimming, cycling or low impact aerobics may be substituted. Walking keeps the risk of DVT minimal and is best maintained for 6 weeks after the treatment for large varicose veins. Surface Veins: The treatment results cannot be guaranteed due to the variation in response from one patient to the next. After one treatment most patients expect a 50%-70% improvement in the area treated. Two treatments are normally required in the same region to obtain reasonably good results. Sometimes three or more sessions may be necessary to achieve a good clearance. The fading process is gradual with treated veins fading slowly up to 6 weeks or more after a treatment. Repeat treatments are therefore organised around 6 weeks or more apart. Ultrasound Guided Injections: Varicose veins can be closed from a single treatment in most patients, however repeat procedures are often required to achieve permanent closure. Large, and smaller but stubborn veins, can require several treatments over time. No scars, hospitalisation or time off work are significant advantages of this technique. Endovenous Laser Treatment: Endovenous laser is a procedure performed in the Specialist Vascular Clinic office under sterile conditions and local anaesthetic. It has been shown to have the highest success rate of any procedure for the eradication of large varicose veins. The suitability for this procedure is determined after Duplex scanning to assess the average diameter and tortuosity of the varicose veins. Charges vary with the type of treatment that is most appropriate and the number of treatments necessary. Medicare provides rebates for injections of varicose veins larger than 2.5mm in diameter and for ultrasound guided procedures. A specific referral from your GP enables you to claim the Medicare rebate. Purely cosmetic veins less than 2.5mm do not attract a Medicare rebate. Sclerotherapy is avoided during pregnancy as a matter of principle, though there are no known adverse effects on the foetus. Should a patient have sclerotherapy while unknowingly pregnant, termination of the pregnancy is definitely not recommended. While sclerosant manufacturers state that sclerotherapy should not be performed whilst on the pill due to a risk of thrombosis, there is no scientific evidence to support this. The risks of an unwanted pregnancy far outweigh the risk of remaining on the pill. Bruises at the injection site will disappear within a few weeks. Blood trapped in a sclerosed vein can appear quite dark. This often makes the veins more noticeable in the first few weeks following treatment. Achingin the leg can occur during the treatment and for the first day or two following treatment. It is more common following the treatment of larger varicose veins and is usually relieved by walking. Nurofen, Voltaren Rapid or Panadol tablets may be taken if necessary. Matting is name given to networks of fine red veins which develop near the site(s) of previous injections. The thighs are the most common site. Some areas of matting resolve spontaneously while some resolve with further treatment. Matting is more common in patients with extensive surface veins, patients who are overweight or have a very fair complexion. Thrombophlebitis is clotting and inflammation which most commonly occurs spontaneously in untreated varicose veins, quite independently of sclerotherapy. It is treated with anti-inflammatory medication, compression and regular daily walking. It presents as red tender areas similar to trapped blood. Ulcers can form at treatment sites within two weeks of injecting. Sometimes they occur due to sclerosant leaking into the surrounding skin. Generally they occur due to sensitivity of the tissues to the concentration of the solution injected. Backflow of sclerosant into small arterioles can also cause ulcers. Ulcers appear to occur more frequently in patients who smoke or are overweight, those who have frail skin or are on prednisone or methotrexate tablets. They are tender, will heal slowly and leave a small, pigmented scar. Allergic reactions to sclerosing solutions and local anaesthetics are rare. They can be serious and life threatening – swelling of lips, mouth and throat are treated by immediate injection of adrenaline. Less serious reactions are treated with antihistamines. Severe abdominal pain has been reported by some patients. Minor rashes require no specific treatment though you should notify Specialist Vascular Clinic if a reaction of any kind occurs. When allergic reactions occur, a different solution can be used for subsequent treatments. Fainting, nausea, vomiting and headache are generally stress or anxiety related reactions. Fevers and chills – with high doses of sclerosant a transient flu-like episode is possible several hours after the procedure. It is rare since the introduction of foam. Ankle swelling can occur if many veins around the feet and ankles are injected or when huge veins are treated. The compression stocking usually prevents this. Infection has been reported though the sclerosants are excellent antiseptics. Deep vein thrombosis (DVT) refers to the development of a clot in the deep veins of the leg. This potentially serious problem is rare if compression stockings and daily walking are adhered to. The risk is approximately 1 in 5000 patients for superficial sclerotherapy, 1 in 1500 for UGS and 1 in 300 for laser therapy. This compares to 1 in 20 to 1 in 50 with surgical stripping. These clots can travel to the lungs and can be fatal. Approximately 1 in 4 people with a DVT have clots in their lungs. DVT has a 1-2% mortality rate. Nerve damage – a temporary numbness of the calf may occur after injections into the saphenous veins below the knee due to nerve irritation. It takes around 3-4 months for the sensation to return to normal but is rare since the introduction of foam sclerotherapy. Historically, large areas of skin damage have been reported from injecting varicose veins. This has occurred by injection of potent solution into small veins. Intra-arterial injections cause gangrene, however, there are normally no arteries near varicose veins and they are readily seen on colour Duplex ultrasound scanning. Veins treated adequately by sclerotherapy will not recur. The underlying predisposition to develop varicose veins remains, however recurrence can be avoided by adequate follow-up. It is important to maintain normal body weight and exercise regularly to minimise the development of new varicose veins. Repeat treatment is simple and more likely to ensure permanent closure. No treatment generally sees the problem progress with time. Daily use of surgical compression stockings can control symptoms and will slow the progression of venous disease, however, the underlying problem does not resolve. Phlebectomy is a minor surgical procedure that avulses small segments of vein via a small skin incision and is used on visible varicosities. Surgical stripping involves a treatment in hospital under general anaesthesia to surgically remove varicose veins via incisions. It is more invasive and has a longer recovery time. Endovenous laser treatment has the highest success rate for the treatment of large varicose veins.